The J. Paul Getty Trust has launched its Open Content Program, making more than 4,600 high-quality images of artwork available for free online. Though works by van Gogh, Rembrandt, and Dürer had already fallen into the public domain, the Getty’s program makes their digital reproductions much easier to use. The Getty is not the first museum to put so many images online this year. The Atlantic has listed the museums and research institutions that have large, high-quality, free-to-use collections of historically or aesthetically notable images online. (Read more in the Atlantic). California Institute of the Arts in Valencia, along with the Roy and Edna Disney/CalArts Theater (REDCAT) in Los Angeles, has received a $244,000 grant from ArtPlace America for the September 2013 edition of “Radar L.A., an International Festival of Contemporary Theater” and a related series of performing artist residencies. California State University, Stanislaus, has received a $20,000 Art Works Research Grant from the National Endowment for the Arts to support a study of the differential impacts of arts participation on California’s Central San Joaquin Valley, in particular Stanislaus County. Christopher Newport University in Newport News, Virginia, has won a $20,000 Art Works Research Grant from the National Endowment for the Arts to support a study using the federal agency’s Survey of Public Participation in the Arts data to develop a multivariate framework for measuring arts participation. The Fleet Library at the Rhode Island School of Design in Providence has received a $50,000 National Forum Grant from the Institute of Museum and Library Services to hold a symposium titled “Materials Education and Research in Art and Design: A New Role for Libraries,” which took place June 6–8, 2013, at the school’s museum. The Galleries at Moore College of Art and Design in Philadelphia, Pennsylvania, has accepted a $20,000 grant from the Pew Center for Arts and Heritage for an upcoming exhibition called Strange Currencies. The Institute of Contemporary Art at the University of Pennsylvania in Philadelphia has received a $25,000 grant from the Pew Center for Arts and Heritage for its upcoming exhibition, Barbara Kasten. The Maine College of Art in Portland has unveiled a new institutional logo, created through a collaboration between Eddie Opara of the design company Pentagram and a group of design faculty and students. The Museum of Modern Art in New York has combined its Department of Prints with the Department of Drawings, creating a new Department of Prints and Drawings. The change took effect on July 1, 2013. The National Gallery in London, England, has partnered with the Getty Research Institute in Los Angeles, California, to add nearly 100,000 records of art sales from more than 1,200 British auction catalogues that were published between 1780 and 1800. The records will join the Getty Provenance Index, a free online art-historical database. Northeastern University in Boston, Massachusetts, has received a $25,000 Art Works Research Grant from the National Endowment for the Arts to support an analysis of American Community Survey data to determine relationships among selections of arts majors, occupational choices, and labor-market outcomes of American college graduates, including artist job holders. The Philadelphia Museum of Art in Pennsylvania has earned a $30,000 planning grant from the Pew Center for Arts and Heritage for a project called “The Contemporary Caucus,” which will engage staff from education, technology, marketing, communications, and exhibitions to identify and implement optimal strategies for connecting with twenty-first-century audiences. The Philadelphia Museum of Art in Pennsylvania has received a Curatorial Travel/Internationally Collaborative Pre-exhibition Convening Grant from the Terra Foundation for American Art for an upcoming exhibition, Paul Strand: Photography and Film for the Twentieth Century. The Rhode Island School of Design in Providence, in partnership with the design firm Project Projects, has completed a new visual identity and website for the school’s museum. Part of the initiative involved the renaming of the exhibiting institution as RISD Museum. Saint Louis University in Missouri has accepted a $20,000 Art Works Research Grant from the National Endowment for the Arts to support a study that will examine how the growth and stability of local arts businesses have contributed to the redevelopment of downtown Saint Louis at the street and block level. The School of the Art Institute of Chicago in Illinois has won a $20,000 grant from the National Endowment of the Arts to support a study of the characteristics, needs, and support systems of ethnically and culturally specific organizations in the United States and Canada. The Toledo Museum of Art in Toledo, Ohio, has achieved a milestone in a twenty-year effort to reduce energy consumption. On May 21, 2013, the museum’s main building, a 101-year-old Beaux Arts structure, stopped drawing power from the electrical grid and even began returning power to the system. The University of Iowa Museum of Art in Iowa City has received permission from its board of regents to construct a new building that will house a collection of 12,000 works. The school’s old exhibition space was destroyed by flooding in 2008. The University of Maryland, College Park, has won a $25,000 Art Works Research Grant from the National Endowment for the Arts to support an analysis of two longitudinal data sets for information about the impact of high school arts education on college attainment, after controlling for certain preexisting differences between arts and nonarts students. The University of Oregon in Eugene has received a $15,000 Art Works Research Grant from the National Endowment for the Arts to support the development of an online, annotated resource that identifies American prison arts programs and their histories, related research, and outcomes analyzed on a rubric to be created for this project. The University of Southern California in Los Angeles has earned a $15,000 Art Works Research Grant from the National Endowment for the Arts to support an analysis of survey data from the National Alliance of Media Arts and Culture to map the spatial relationships of media arts organizations to local community characteristics and target audiences. West Chester University in West Chester, Pennsylvania, has received a $25,000 Art Works Research Grant from the National Endowment for the Arts to support a study examining the physiological impacts of participation in music, dance, and the visual arts on economically disadvantaged children. The Whitney Museum of American Art in New York has approved a new graphic identity and logo—which it calls the “responsive W”—in consultation with the design studio Experimental Jetset. Warren Wilson College in Swannanoa, North Carolina, has received a $2.1 million grant from the Windgate Charitable Foundation to enhance its Art Department with the addition of studio craft and material arts and to foster a close partnership between it and the Center for Craft, Creativity, and Design. The Wolfsonian–FIU at Florida International University in Miami Beach, Florida, has accepted a $5 million donation from the Knight Foundation to fund a project to make the museum’s collection digitally accessible within five years. Keliy Anderson-Staley has joined the School of Art at the University of Houston in Texas as a tenure-track professor of photography. Rebecca Parker Brienen has been named Vennerberg Professor of Art and head of the Department of Art, Graphic Design, and Art History at Oklahoma State University in Stillwater. Brienen previously served as the head of art history at the University of Miami in Coral Gables, Florida, from 2008 to 2013. Jean M. K. Miller has joined the University of Missouri in St. Louis as dean of the College of Fine Arts and Communication and professor in the Department of Art and Art History. Miller was formerly associate dean of administrative affairs in the College of Visual Arts and Design at the University of North Texas in Denton. Kent Minturn, a lecturer in the Department of Art History and Archaeology at Columbia University in New York, has been appointed director of the MA Program in Modern Art: Critical and Curatorial Studies. Jennifer Raab, the first IFA/Andrew W. Mellon Foundation Postdoctoral Fellow at New York University’s Institute of Fine Arts, has joined the faculty of Yale University in New Haven, Connecticut. Erika Schneider has been promoted to associate professor in the Art Department at Framingham State University in Framingham, Massachusetts, where she has taught since 2007. Mark Tribe, an artist, educator, and the founder of Rhizome, has become chair of the MFA Fine Arts Department at the School of Visual Arts in New York. Sarah Victoria Turner, a lecturer in the Department of the History of Art at the University of York in York, England, has been appointed to the new post of assistant director for research at the Paul Mellon Centre for Studies in British Art in London. Her appointment begins in November 2013. Deborah Zlotsky, an artist who taught at the College of Saint Rose in Albany, New York, from 1996 to 2013, has accepted a teaching position at the Rhode Island School of Design in Providence. Gloria Groom, David and Mary Winton Green Curator in the Department of Medieval through Modern European Painting and Sculpture at the Art Institute of Chicago in Illinois, has been appointed the museum’s first senior curator. Jennifer Gross has joined the DeCordova Sculpture Park and Museum in Lincoln, Massachusetts, as deputy director for curatorial affairs and chief curator. Gross had served as Seymour H. Knox Jr. Curator of Modern and Contemporary Art at the Yale University Art Gallery in New Haven, Connecticut, since 2000. Sarah Schroth, Nancy Hanks Senior Curator at Duke University’s Nasher Museum of Art in Durham, North Carolina, has been named the museum’s new Mary D. B. T. and James H. Semans Director. Schroth had been serving as interim director since November 2012. Susan Shifrin, associate director for education at the Philip and Muriel Berman Museum of Art at Ursinus College in Collegeville, Pennsylvania, has left the museum to serve as director of ARTZ Philadelphia, a newly formed chapter of ARTZ: Artists for Alzheimer’s. Janne Gallen-Kallela-Sirén, formerly director of the Helsinki Art Museum in Finland, has become the new director of the Albright-Knox Art Gallery in Buffalo, New York. Maura Reilly has been appointed executive director of the Linda Pace Foundation, based in San Antonio, Texas. Most recently Reilly was professor and chair of art theory at Queensland College of Art, part of Griffith University in Nathan, Australia. Tali Weinberg, program officer for Global Goods Partners, a nonprofit that provides economic opportunity, small grants, and training to artisans in marginalized communities around the world, has been selected to lead the Textile Society of America, based in Berkeley, California, as executive director. The Exhibitor and Advertiser Prospectus for the 2014 Annual Conference in Chicago is now available for download. Featuring essential details for participation in the Book and Trade Fair, the booklet also contains options for sponsorship opportunities and advertisements in conference publications and on the conference website. 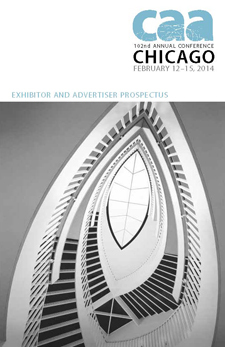 The Exhibitor and Advertiser Prospectus will help you reach a core audience of artists, art historians, educators, students, and administrators, who will converge in Chicago for CAA’s 102nd Annual Conference, taking place February 12–15, 2014. With three days of exhibit time, the Book and Trade Fair will be centrally located at the Hilton Chicago Hotel, where all programs sessions and special events take place. CAA offers several options for booths and tables that can help you to connect with conference attendees in person. The priority deadline for Book and Trade Fair applications is Thursday, October 31, 2013; the final deadline for all applications and full payments is Monday, December 9, 2013. In addition, sponsorship packages will allow you to maintain a high profile throughout the conference. Companies, organizations, and publishers may choose one of four visibility packages, sponsor specific areas and events such as the Student and Emerging Professionals Lounge, or work with CAA staff to design a custom package. Advertising possibilities include the Conference Program, distributed to approximately five thousand registrants, and the conference website, seen by tens of thousands more. The final deadline for sponsorships and advertisements in the Conference Program is Friday, December 6, 2013. Questions about the 2014 Book and Trade Fair? Please contact Paul Skiff, CAA assistant director for Annual Conference, at 212-392-4412. For sponsorship and advertising queries, speak to Virginia Reinhart, CAA marketing and communications associate, at 212-392-4426. CAA offers Annual Conference Travel Grants to graduate students in art history and studio art and to international artists and scholars. In addition, the Getty Foundation has funded the second year of a program that enables twenty applicants from outside the United States to attend the 2014 Annual Conference in Chicago. Applicants may apply for more than one grant but can only receive a single award. CAA will award a limited number of $250 Graduate Student Conference Travel Grants to advanced PhD and MFA graduate students as partial reimbursement of travel expenses to attend the 102nd Annual Conference, taking place February 12–15, 2014, in Chicago. To qualify for the grant, students must be current CAA members. Successful applicants will also receive complimentary conference registration. Deadline: September 13, 2013. CAA will award a limited number of $500 International Member Conference Travel Grants to artists and scholars from outside the United States as partial reimbursement of travel expenses to attend the 102nd Annual Conference, taking place February 12–15, 2014, in Chicago. To qualify for the grant, applicants must be current CAA members. Successful applicants will also receive complimentary conference registration. Deadline: September 13, 2013. The CAA International Travel Grant Program, generously supported by the Getty Foundation, provides funding to twenty art historians, museum curators, and artists who teach art history to attend the 102nd Annual Conference, taking place February 12–15, 2014, in Chicago. The grant covers travel expenses, hotel accommodations, per diems, conference registrations, and one-year CAA memberships. The program also includes a one-day preconference meeting to be held on February 11, providing grant recipients and their hosts with the opportunity to address their common professional interests and issues. Applicants do not need to be CAA members. Deadline extended: August 23, 2013. 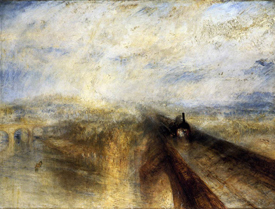 Joseph Mallord William Turner, Rain, Steam and Speed—The Great Western Railway, 1844, oil on canvas, 35⅞ x 49 in. National Gallery, London (artwork in the public domain). Joseph Ackley, a PhD candidate in art history at New York University’s Institute of Fine Arts, has been awarded a research grant for his participation in the Mellon Research Initiative conference, “Art History and the Art of Deception,” taking place in October 2013. Sarah Archino, a teaching fellow in the Department of Art at Millsaps College in Jackson Mississippi, who earned her doctorate in art history from the Graduate Center, City University of New York, has accepted a 2013–15 postdoctoral teaching fellowship at the Institut National d’Histoire de l’Art in Paris, France, from the Terra Foundation for American Art. Chris Barnard, an artist based in Los Angeles, California, has spent the month of June 2013 in residency at the Vermont Studio Center in Johnson, Vermont. Julia Whitney Barnes, an artist based in Brooklyn, New York, has received a commission to create a permanent glass-mosaic installation, titled Coloridas Historias de México, for the Brooklyn School of Inquiry. Sinclair Bell, associate professor of art history at Northern Illinois University in DeKalb, has been awarded a Howard Fellowship from the Howard Foundation at Brown University for 2013–14 to complete a monograph on chariot racing in ancient Rome. Sarah Berkeley has been named a resident artist by the Artists’ Cooperative Residency and Exhibitions (ACRE) in Steuben, Wisconsin. Berkeley’s collaborator, Regin Igloria, will join her during the summer 2013 program. Wendy Bellion, associate professor in the Department of Art History at the University of Delaware in Newark, has received an eight-week visiting professorship at the Institut National d’Histoire de l’Art in Paris, France, for spring 2015. Steven Bleicher has been awarded a commission to produce a public art project, called Nature and Man in Rhapsody of Light at the Water Cube, in Beijing, China. His collaborators for the work were the artist Jennifer Wen Ma and the lighting designer Zheng Jianwei. Bleicher was the color specialist. Katherine Bussard, Peter C. Bunnell Curator of Photography at the Princeton University Art Museum in Princeton, New Jersey, has earned a 2013 Grant to Individuals in the publication category from the Graham Foundation for Advanced Studies in the Fine Arts. Her publication is called Unfamiliar Streets: Photographs by Richard Avedon, Charles Moore, Martha Rosler, and Philip-Lorca diCorcia. Kimberly Callas, an artist based in Brooks, Maine, has received a Puffin Foundation Grant for her sculptural project Portraits of the Ecological Self. The project includes ten hand-sculpted, life-size portraits that combine a detailed likeness of an individual with natural materials chosen to reveal the unique bond an individual has with nature. Grace Chuang, a doctoral student in art history at New York University’s Institute of Fine Arts, has received the 2013–14 IFA/Centre Allemand Fellowship in Paris, France. John J. Curley, assistant professor in the Department of Art at Wake Forest University in Winston Salem, North Carolina, has received a publication grant from the Terra Foundation for American Art for his book A Conspiracy of Images: Andy Warhol, Gerhard Richter, and Cold War Visuality, forthcoming from Yale University Press. Melissa Dabakis, professor of art history at Kenyon College in Gambier, Ohio, has received a publication grant from the Terra Foundation for American Art for her book The American Corinnes: Women Sculptors and the Eternal City, 1850–1876, forthcoming from Pennsylvania State University Press. Andrew Demirjian, an artist based in Palisades Park, New Jersey, has been awarded a 2013 New Jersey Individual Artist’s Fellowship in the media/digital art category from the New Jersey State Council on the Arts. Laura DeVito, a student in the MFA program in collaborative design at Pacific Northwest College of Art in Portland, Oregon, has completed a 2013 Spring Break Residency with Signal Fire in the deserts of Southern California. Barbara Diener has accepted a residency for summer 2013 at the Artists’ Cooperative Residency and Exhibitions (ACRE), based in Steuben, Wisconsin. Rob Duarte has been awarded a summer 2013 residency at the Artists’ Cooperative Residency and Exhibitions (ACRE), based in Steuben, Wisconsin. Sam Durant, an artist based in Los Angeles, California, has been selected to participate in the 2013 Getty Artists Program, administered by the Education Department at the J. Paul Getty Museum in Los Angeles. Kara Fiedorek, a doctoral student in art history in the Institute of Fine Arts at New York University, has accepted a research grant for her upcoming participation in a Mellon Research Initiative conference, “Art History and the Art of Deception,” scheduled for October 4–5, 2013. Coco Fusco, an interdisciplinary artist and writer based in Brooklyn, New York, has completed a May–June 2013 residency at the Atlantic Center for the Arts in New Smyrna Beach, Florida. Ken Gonzales-Day, an artist and the chair of the Art Department at Scripps College in Claremont, California, has accepted a 2013 summer residency at the Terra Residency Program in Giverny, France. He will work on a project called Absence, Stasis, and Other Non-Decisive Moments. Ellery Foutch, who completed her PhD in the History of Art Department at the University of Pennsylvania in Philadelphia, has earned a 2013–15 postdoctoral teaching fellowship at the Courtauld Institute of Art in London, England, with help from the Terra Foundation for American Art. Jennifer Greenhill, associate professor of art history in the School of Art and Design at the University of Illinois, Urbana-Champaign, has been awarded an eight-week visiting professorship at the Institut National d’Histoire de l’Art in Paris, France, for spring 2014, thanks to the Terra Foundation for American Art. Kenneth Haltman, H. Russell Pitman Professor of Art History in the School of Art and Art History at the University of Oklahoma in Norman, has accepted a visiting professorship in the John F. Kennedy Institute at Freie Universität in Berlin, Germany, for spring–summer 2014, with assistance from the Terra Foundation for American Art. Adam Han, an MFA student in fiber and material studies at the School of the Art Institute of Chicago in Illinois, has been chosen as a 2013 Windgate Museum Intern by the Center for Craft, Creativity, and Design. He will contribute to a digital exhibition at the Smithsonian Institution’s Archives of American Art in Washington, DC, that tells the story of studio craft in the United States through primary-source material. Andrew Hemingway, emeritus professor of history of art in the Department of History of Art at University College London in England, has accepted a visiting professorship in the John F. Kennedy Institute at Freie Universität in Berlin, Germany, for fall–winter 2013, courtesy the Terra Foundation of American Art. Christopher Heuer, assistant professor in the Department of Art History and Archaeology at Princeton University in Princeton, New Jersey, has accepted a 2013 Grant to Individuals in the category of public program from the Graham Foundation for Advanced Studies in the Fine Arts. He will work on a project called “7 March 1965” with his collaborators, Abbey Dubin and Matthew Jesse Jackson, in a collective called Our Literal Speed. Patricia Hills, professor in the Department of History of Art and Architecture at Boston University in Massachusetts, has been selected as a guest lecturer for 2013 at the Terra Summer Residency in Giverny, France. She will present “Whatever Happened to the ‘New Art History’? Reflections on Theoretical and Methodological Approaches since the 1970s. Marina Kliger, a PhD student in art history in the Institute of Fine Arts at New York University, has accepted a nine-week summer internship at the National Gallery of Art in Washington, DC. She will catalogue and digitize rare French and Belgian reproductive prints. Ethan W. Lasser, Margaret S. Winthrop Associate Curator of American Art at the Harvard Art Museums in Cambridge, Massachusetts, has received the ninth annual Patricia and Phillip Frost Essay Award from the editorial board of the journal American Art, published by the Smithsonian American Art Museum, based in Washington, DC. His article, “Selling Silver: The Business of Copley’s Paul Revere,” appeared in the Fall 2012 issue of the journal. Craig Lee, a doctoral candidate in the Department of Art History at the University of Delaware in Newark, has taken a nine-week summer internship at the National Gallery of Art in Washington, DC. He will review files, construction plans, and progress photographs to produce materials showing the development and evolution of the museum’s master facilities plan projects. Sara Lees, along with her coauthors Richard Tand and Sandra L. Webber, has won the thirty-third annual George Wittenborn Memorial Book Award from the Art Libraries Society of North America. Their publication is called Nineteenth-Century European Paintings at the Sterling and Francine Clark Art Institute (Williamstown, MA: Sterling and Francine Clark Art Institute, 2012). Michael Lobel, professor of art history at Purchase College, State University of New York, in Purchase, New York, has received a 2012–13 Chancellor’s Award for Excellence from his institution. The award recognizes his work in the category of scholarship and creative activities. Stéphane Loire, chief curator in the Paintings Department at the Musée du Louvre in Paris, France, has been named a 2013–14 museum guest scholar by the Getty Research Institute in Los Angeles, California. His host at the J. Paul Getty Museum will be the Department of Paintings. Christopher Manzione, an artist based in Vernon, New Jersey, has been awarded a 2013 New Jersey Individual Artist’s Fellowship in the category of media/digital art from the New Jersey State Council on the Arts. Lee Mazow, associate professor of art history in the Department of Art at the University of Arkansas in Fayetteville, has been awarded the twenty-fifth annual Charles C. Eldredge Prize for Distinguished Scholarship in American Art from the Smithsonian American Art Museum, based in Washington, DC. The prize recognizes his latest book, Thomas Hart Benton and the American Sound (University Park: Pennsylvania State University Press, 2012). Kori Newkirk, an artist based in Los Angeles, California, has won a 2013 fellowship from the Fellows of Contemporary Art. The award comes with a $10,000 prize. Laura Hart Newlon has accepted a residency at the Artists’ Cooperative Residency and Exhibitions (ACRE) in Steuben, Wisconsin. Newlon’s collaborator, Kate O’Neill, will join her at the summer 2013 program. Kasia Ozga has been awarded a summer 2013 residency at the Artists’ Cooperative Residency and Exhibitions (ACRE), based in Steuben, Wisconsin. Steve Rowell, an artist, curator, and researchers, has won a 2013 Grant to Individuals in the film category from the Graham Foundation for Advanced Studies in the Fine Arts. His project is called Parallelograms. Casey Ruble, an artist based in Clinton, New Jersey, has been awarded a 2013 New Jersey Individual Artist’s Fellowship for her works on paper from the New Jersey State Council on the Arts. Emily Schlemowitz, an MA student in art history at Hunter College, City University of New York, has been selected as a 2013 Windgate Museum Intern by the Center for Craft, Creativity, and Design. She will work closely with curatorial and exhibitions staff at the John Michael Kohler Arts Center in Sheboygan, Wisconsin, to assist with research in preparation for the 2014 Arts/Industry exhibition and publication. Ileana Selejan, a PhD student in art history in the Institute of Fine Arts at New York University, has been awarded a research grant to participate in a Mellon Research Initiative conference, “Art History and the Art of Deception,” that will take place October 4–5, 2013. Elizabeth Simmons, a graduate student on the PhD curatorial track in the Department of Art History at the University of Delaware in Newark, has accepted a nine-week summer internship at the National Gallery of Art in Washington, DC. She will assist in updating collections records according to recent catalogues raisonnés and other art-historical research. Xiao Situ, a PhD student in the Department of the History of Art at Yale University in New Haven, Connecticut, has accepted a 2013–14 predoctoral fellowship from the Wyeth Foundation for American Art. Situ will continue research and writing for “Emily Dickinson’s Window Culture, 1830–86” at the Smithsonian American Art Museum in Washington, DC. Marie M. Sivak, an artist based in Portland, Oregon, has received the 2013 Margo Harris Hammerschlag Direct Carving Award, which comes with a $10,000 prize. Deborah Stratman, an artist and filmmaker based in Chicago, Illinois, has won a 2013 Grant to Individuals in the exhibition category from the Graham Foundation for Advanced Studies in the Fine Arts. Her project is titled Subsurface Voids. Edward J. Sullivan, Helen Gould Sheppard Professor in the History of Art at New York University’s Institute of Fine Arts, has received a publication grant from the Terra Foundation for American Art. His book, forthcoming from Yale University Press, is called From San Juan to Paris and Back: Francisco Oller, Caribbean Artist in the Age of Impressionism. Tina Tahir, an artist based in Chicago, Illinois, has been selected a winner of the 2013 ARTslanT Prize for her mixed-media sculpture Thirty (2012). Spencer Wigmore, a doctoral student in the Department of Art History at the University of Delaware in Newark, has taken a nine-week summer internship at the National Gallery of Art in Washington, DC. He will assist in research and organization for a forthcoming exhibition on nineteenth-century American landscape photography. Claire Zimmerman, assistant professor of art history and architecture at the University of Michigan in Ann Arbor, has won a 2013 Grant to Individuals for a publication from the Graham Foundation for Advanced Studies in the Fine Arts, based in Chicago, Illinois. Her book project is called Photographic Modern Architecture. David Anfam, Clyfford Still: Memory, Myth, and Magic. Clyfford Still Museum, Denver, Colorado, May 24–September 29, 2013. Reni Gower. Radiant: Contemporary Encaustic. Slocumb Galleries, Eastern Tennessee State University, Johnson City, Tennessee, August 19–September 20, 2013. Reni Gower. Shadow and Light. Tinney Contemporary, Nashville, Tennessee, May 18–June 29, 2013. Alice Ming Wai Jim. Yam Lau: A World Is a Model of the World. Darling Foundry, Montreal, Quebec, Canada, June 6–August 25, 2013. Aaron Krach and Courtney Childress. No Name. On Stellar Rays, New York, June 20–July 31, 2013. Birgit Rathsmann. October 18, 1977. Klemens Gasser and Tanja Grunert, New York, June 20–July 19, 2013. Matthew Biro. Anselm Kiefer (New York: Phaidon, 2013). Jane Block and Claude Sorgeloos, eds. Homage to Adrienne Fontainas: Passionate Pilgrim for the Arts (New York: Peter Lang, 2013). Francesco Freddolini. Giovanni Baratta 1670–1747: Scultura e industria del marmo tra la Toscana e le corti d’Europa (Rome: L’Erma di Bretschneider, 2013). Joni M. Hand. Women, Manuscripts, and Identity in Northern Europe, 1350–1550 (Burlington, VT: Ashgate, 2013). Katie Grace McGowan, ed. Post-Industrial Complex (Detroit: Museum of Contemporary Art Detroit, 2013). Anita Fiderer Moskowitz. Forging Authenticity: Giovanni Bastianini and the Neo-Renaissance in Nineteenth-Century Florence(Florence: Leo S. Olschki, 2013). Richard Taws. The Politics of the Provisional: Art and Ephemera in Revolutionary France (University Park: Pennsylvania State University Press, 2013). Xin Wu. Patricia Johanson and the Re-Invention of Public Environmental Art, 1958–2010 (Burlington, VT: Ashgate, 2013). Celebrating its fifteenth anniversary as a born-digital journal this fall, caa.reviews continues its exploration of the scholarly review medium through “Exhibitions Close Up—Bernini: Sculpting in Clay.” This multimedia, open-access project focuses on the recent exhibition that assembles over forty small terra-cotta models made by the Baroque sculptor Gian Lorenzo Bernini to visualize large sculptures. The project was made possible through a grant to CAA from the Alliance for Networking Visual Culture. Conceived by Sheryl Reiss, editor-in-chief of caa.reviews, and broadened through discussion with the journal’s editorial board, the project explores the Bernini exhibition in several ways. It provides a traditional scholarly review of the presentation at both its venues—the Metropolitan Museum of Art in New York and the Kimbell Art Museum in Fort Worth, Texas—and a review by the sculptor Denise Pelletier. Central to the project is a video walk-through at the Kimbell that juxtaposes close views of Bernini’s terra-cotta models with physical movement within the gallery spaces and around the objects on display, giving the viewer a close approximation of visiting the exhibition in person. The project—which also includes a bibliography, previously published essays on and reviews of Bernini’s work and methods from The Art Bulletin and caa.reviews, additional educational videos about the artist’s work, the Kimbell floor plan of the exhibition, comparative illustrations showing completed pieces, and an interview with C. D. Dickerson, curator of European art at the Kimbell—provides a comprehensive resource for Bernini’s oeuvre and influence as well as an in-depth look at an important monographic exhibition. The Alliance for Networking Visual Culture (ANVC) developed the Scalar digital authoring platform with support from the Andrew W. Mellon Foundation and the National Endowment for the Humanities. The Art Bulletin also used this platform for an anniversary project launched in February 2013, called “Publishing The Art Bulletin: Past, Present, and Future,” that was developed by Thelma Thomas, (then) chair of the Art Bulletin Editorial Board and associate professor at the Institute of Fine Arts, New York University. Additional projects using the Scalar platform can be viewed on the ANVC website. The minimum browser requirements for “Exhibitions Close Up—Bernini: Sculpting in Clay” are Internet Explorer 9.0, Firefox 4.0, Chrome 7.0, and Safari 5.0.